Streamline communicatons, turn over rooms quickly and minimize the need for training with an intuitive PMS. 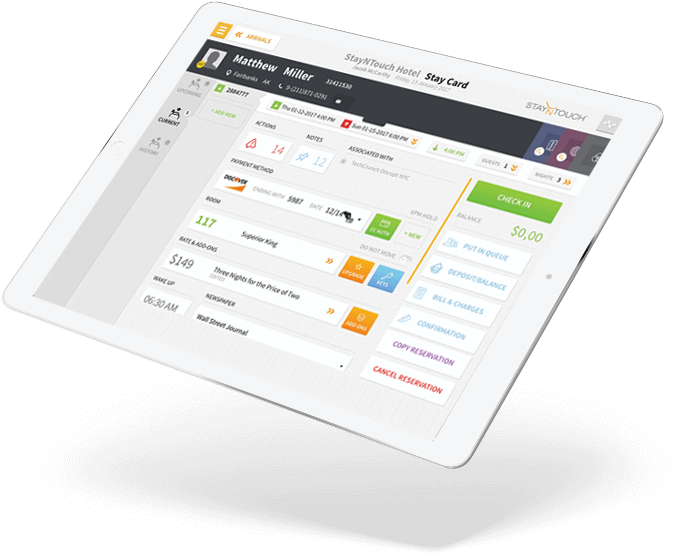 Transform your property management software from a cost center to a revenue generator with automated upsells at every guest interaction. Run your hotel from any location – on-property or off. Our PMS system allows you to make changes to rates and availability on the go! Grow with unlimited interfaces, stay ahead of market trends and connect to best-of-breed solutions. Improve staff onboarding and reduce training time. Increase your property’s visibility with real-time PMS software integrations. Seamless cross-department communication increases staff efficiency, resulting in happier guests. Access hotel availability, guest data, and booking details in real-time. 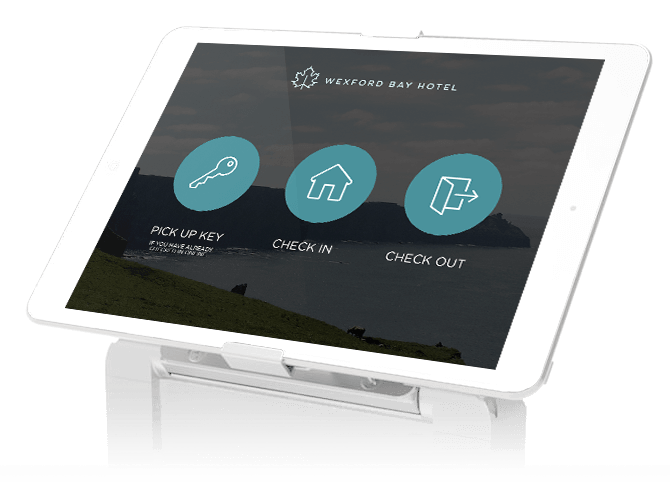 Smartphone, tablet, and desktop friendly: instantly connect with your guests on their mobile devices. Offer room upgrades that boost your revenue numbers. Unlock positive guest reviews about your property. Collect extra earnings when guests purchase early check in and late check out offers. Decrease lines and reduce wait time for guests. Monetize on tech-trends that drive guest-engagement. Arm your hotel with self-service stations that work with your property management software and transform the guest experience. Streamline the check-in, key retrieval, and check-out processes with on-site, self-service stations. Enlist the easy-to-use tech sweeping through customer-centric industries with an updated PMS system. Be a leader in innovative guest-facing technology. Give Your Guests What They Want. PMS software that’s available in the cloud, accessible on any device. Run your hotel from anywhere. Now your staff can work completely untethered. No hardware installation necessary. Get rid of all of the maintenance costs and IT headaches. Now your IT team will work in the cloud. Capitalize on additional revenue with easy in-software up-sells and upgrades. Now your hotel property management software is at the forefront of your bottom line. Simple and intuitive. Staff and guest-facing. The days of long and expensive training are over! This PMS is built to allow your staff to hit the ground running in minutes. Not all guests are the same. Now your guests have the option to check in via their mobile device, see a friendly face at the front desk or check-in at a self-service station. Streamline hotel staff tasks and communications. Now your front of house and back of house can work faster and more efficiently . 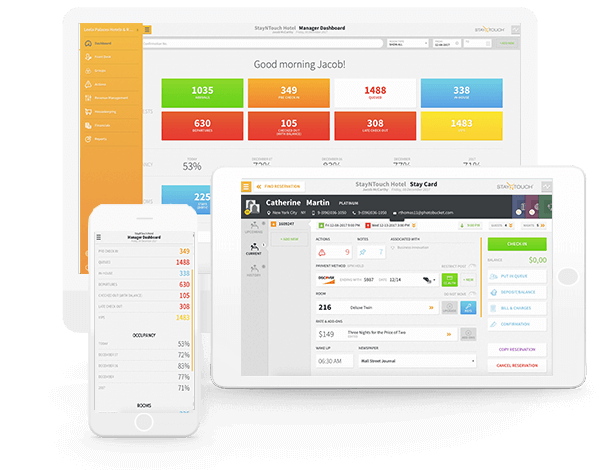 Learn more about StayNTouch, a leader in hotel property management software. Our PMS software was designed specifically for hotels. Take the demo today. We live in a constantly connected world where guests and staff alike expect immediate responses to their concern. There’s no excuse for not being constantly tuned in to the operations of your property, something that legacy property management software can’t provide. We built StayNTouch to solve this problem. Today’s on-the-go property managers need a mobile-first PMS system that allows hoteliers and managers to connect with their staff from anywhere. Freeing your team from the front desk is the first step to providing the personalized service and efficient response times that today’s guests require. StayNTouch was created with mobility in mind. 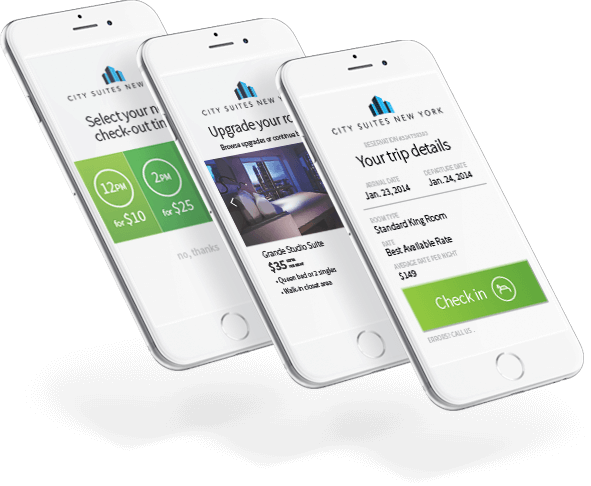 Our property management software operates on tablets and smartphones which gives a property the ability to implement a newer, faster hotel PMS without the need for costly hardware upgrades. Our PMS software already runs over 90,000 rooms globally. We bring hotel management into the 21st century with hotel property management software that reflects the needs of your increasingly tech-savvy guests. At StayNTouch, we thrive on connecting forward-thinking hoteliers and property managers with the tools they need and their guests desire. We’re putting the power to check in and out in the hands of the customers and the power to do everything else in the hands of your staff. Schedule a free demo today. See What a New Hotel PMS Can Do for Your Property.